Did you know that the seeds inside ripe tomatoes are fully developed and can be saved and replanted next season? Even if you only have a small garden, you can still easily save seeds from some of your favorite garden vegetables and flowers. Join Shanyn Siegel, former Seed Curator for Seed Savers Exchange, co-founder of Seedshed, and co-editor of The Seed Garden: The Art and Practice of Seed Saving as she leads a discussion of the seed-saving movement and explains how to plan your garden to ensure a bountiful harvest of healthy, true-to-type seeds. Discover and demystify the botany of seed saving, from the scientific processes involved in the formation of a seed to plant-pollinator relationships to the various ways plants disperse their seeds. 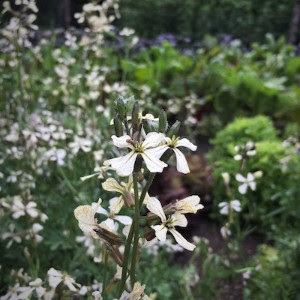 Filled with tips and practical advice for saving seeds in your own garden, this is a wonderful opportunity to explore the idea that we all—gardeners and eaters alike—play a role in stewarding one of our most valuable natural resources: seeds. You’ll leave this informative presentation with some seeds harvested from Shanyn’s garden—and with the confidence to begin collecting seeds from your own garden. We will also have copies of Shanyn’s book for sale that she will be happy to sign.